Riverside Primary | Riverside “Little Dribblers” Medal Presentation at Newcastle Eagles Game! Riverside “Little Dribblers” Medal Presentation at Newcastle Eagles Game! 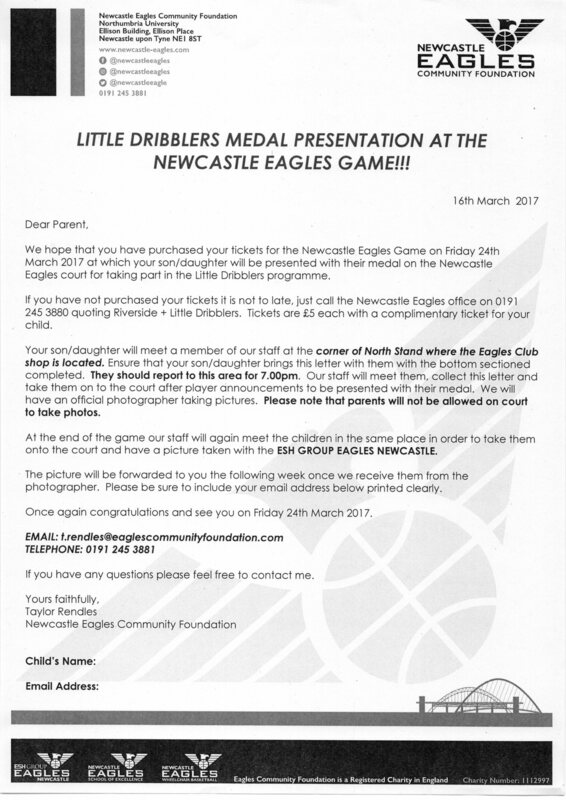 23 Mar Riverside “Little Dribblers” Medal Presentation at Newcastle Eagles Game! The children in our Basketball After-school Club have been receiving some excellent coaching sessions from the Newcastle Eagles this term. We have been incredibly luck to secure a reduced price for tickets at just £5.00 each with a complimentary ticket for your child for the Newcastle Eagles game tomorrow night. Letters were sent home to inform you this last week and the letter below will be going home tonight with the children. We would love as many parents/carers to support the children at this fantastic event. If you have never been to a basketball game before – don’t miss this great opportunity to see your little one courtside!